You may think you're feeding Fido top-of-the-line dog food, but without an understanding of pet food labels, you may be putting your pooch at risk. It takes more than just reading the catchy brand name and nutritional claims that pop out at you to really comprehend what your pets are eating. In the United States, the federal government requires pet food manufacturers to list specific information on the outside of each package, such as the ingredients, where the food is made and the amount of food in that container. The U.S. Food and Drug Administration's (FDA) Center for Veterinary Medicine regulates the standards that the American Association of Feed Control Officials (AAFCO) sets. Some states also have an additional set of standards for pet food. Typically, states' regulations align with AAFCO's guidelines and require labels to include a product's name, the guaranteed analysis of ingredients, a nutritional adequacy statement, feeding directions and calorie statements. Pet food makers must guarantee that what's in the box, bag or can contains the fiber, fat, moisture and crude protein stated on the packaging [source: Consumer Reports]. Canada appears to have stricter rules. The Pet Food Association of Canada bans specified risk materials (SRMs) from being fed to any animal. What's more, Canadian law requires labels to list the pet food's nutritional adequacy and life stage for which the food is suitable. You need to know a few things about a pet food's name. Keep in mind several U.S. government regulations. When it comes to the product's name, manufacturers have to focus on the facts. If a label on a product lists an ingredient in its name, at least 95 percent of the food must be made with that ingredient. For example, Big Bob's Beefy Dog Chow must contain at least 95 percent beef. If a label lists two ingredients in its name, the one listed first must comprise a higher concentration than the second. So, Big Bob's Beef-Ham Dog Chow has to contain more beef than ham. Beyond the label, the package will probably use showy words and pictures to convince you that it's the best choice for your furry, feathery or scaly friend. If less than 25 percent of the canned or dry product is made with a named ingredient, then the company must disclose that by using a term to signify that it's not a whole food. If the label on Big Bob's Beef-Grain Dog Chow has wording saying it provides omega-3 fatty acids, it can't say "high in omega-3s" unless that nutrient makes up at least 25 percent of the food composition. Rather, the manufacturer will have to use a phrase like "contains omega-3s." The list of ingredients, which is usually located on the back of the bag, cites ingredients in order of predominance by weight [source: FDA]. Certain label claims, like the terms premium, gourmet and complete, are subjective and unsubstantiated. One especially problematic claim is the word "natural" -- this isn't the same as organic. According to the American Medical Veterinary Association (AMVA), packaging labels might not always be a reliable source of information. Although a pet food label may say it contains beef, it's highly unlikely that you're getting the same stuff you put on your own plate. That meat is sold for human consumption, and what's left -- bones, gristle, snouts and hooves -- are sold to pet food manufacturers and processed into those meaty-looking nuggets you feed to Rusty. 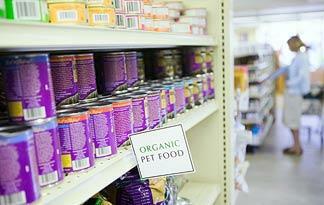 Clearly, there's more than meets the eye when it comes to pet food labels. To be a savvy shopper, familiarize yourself with the U.S. FDA standards. Another option that may suit you is making your own pet food.